On May 8, President Trump announced that he was pulling the U.S. out of the Iran deal. On May 12, Secretary of State Mike Pompeo announced his 12 points demanding total capitulation of Iran to the U.S. government. In doing so, he effectively putting the U.S. on a war path with Iran. This deepening engagement of the U.S. in the Middle East defies logic. It is contrary to the geopolitical interests of the U.S. The main argument for America’s engagement in the Middle East is oil and trade. For starters, the U.S. no longer relies on imported oil. 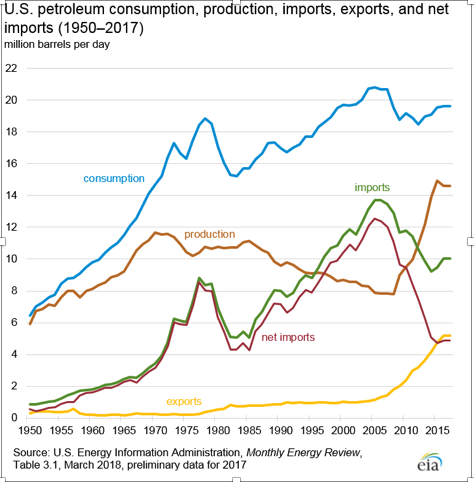 In 2017, the net import of petroleum was 19% of total U.S. oil consumption, the lowest since 1967. 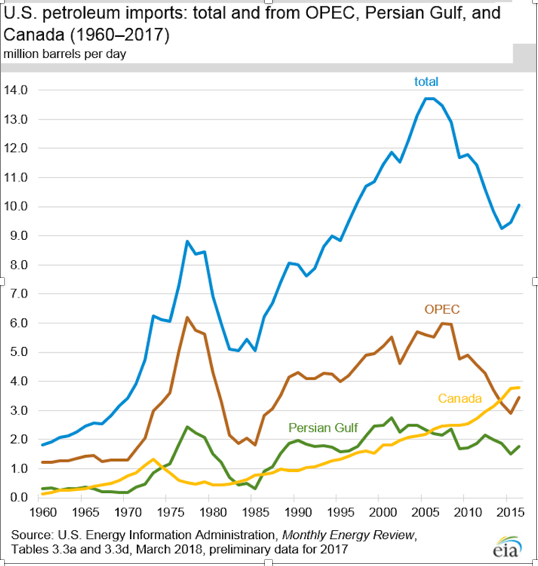 And of that dwindling imported oil portion that the U.S. relies on for energy security, the share of imports from OPEC and Persian Gulf countries has declined. Today, Canada is the largest source of U.S. petroleum imports, representing 40% of its total. Second, the Middle East is not an important market for U.S. exports. In 2016, according to the World Bank, total U.S. exports amounted to almost $1.6 trillion, of which our two closest allies in the region — Saudi Arabia and Israel — took roughly 1% each, even when the value of all American weapons sold in the region is included. 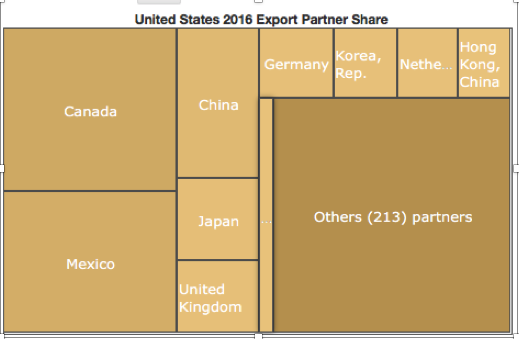 Today the U.S. top export markets are Canada, Mexico, China, Japan, and E.U. countries. In addition, the two most important maritime trade routes are the English Channel and the Strait of Malacca. The Channel has traffic on both the UK-Europe and North Sea-Atlantic routes, and is the world’s busiest seaway, accommodating over 500 ships per day. The Strait of Malacca runs between Indonesia, Malaysia and Singapore, and according to estimates from the United Nations Conference on Trade and Development’s (UNCTAD) Review of Maritime Transport 2011, almost half of the world’s total annual seaborne trade tonnage passed through the Strait of Malacca. There are two other arguments for U.S. involvement in the Middle East, one altruistic and the other Machiavellian. While American reliance on Middle Eastern oil has diminished, the Middle East remains an important producer of the world’s oil. 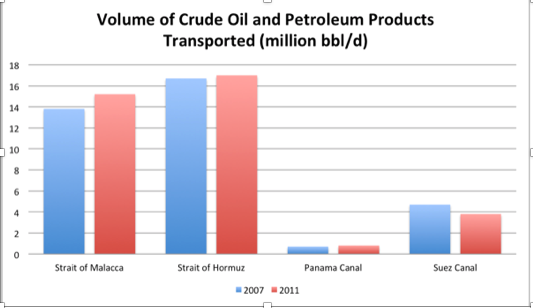 Of the 87 million barrels of oil produced per day globally in 2011, approximately 20% passed through the Strait of Hormuz. Some argue that the U.S. plays a crucial and altruistic role in protecting the free flow of oil from the Middle East and through the strait of Hormuz. Only the U.S. can prevent a global oil shock that could rock the global economy. But that American goodwill comes at a real price tag for the American taxpayer. Roger J. Stern of Princeton University estimates that the U.S. has spent $8 trillion between 1976 and 2010 protecting the oil flow from the Persian Gulf. The worry is that Iran, or another bad actor, could shut down the oil traffic in the Middle East and bring the world to its knees. This argument, however, belies the fact that oil is the lifeline of the Iranian economy and shutting down oil production or flow from the Middle East would also suffocate its own economy, and that any such action will bring together a global coalition to roll back Iran and reopen the flow of oil. Others argue that U.S. military hegemony over the Persian Gulf is much more Machiavellian. They point out that the U.S. has not simply protected the free flow of the oil trade, but has also used its power to sanction oil production in countries whose policies it opposes, such as Iran, Sudan, Syria, and Libya. In line with this argument that U.S. hegemony over the Persian Gulf is pursued not merely to protect friends but also to punish enemies, the U.S. is ultimately seeking leverage over China by preserving its control over the Persian Gulf. But the U.S. already has significant forward power projection in the region, with both the Navy’s 5th Fleet headquartered in Bahrain and the U.S. Air Force at the Al Udeid air base in Qatar. The security of both these bases is jeopardized and the cost of maintaining our presence there is increased by provoking Iran as Trump and Pompeo are doing. Moreover, Roger Stern, in a piece published by TIME magazine, argues that the current U.S. military emphasis on the Persian Gulf has diverted precious defense resources away from the western Pacific, where China poses a far graver, long-term threat to American interests. Today, any further U.S. military involvement in the Middle East is counterproductive to America’s interest. Ironically, President Trump ran his presidential campaign in part by building on Americans’ frustration with what they view as a foreign policy failure in the Middle East, promising to pull the U.S. out of the region. Instead America is deepening its involvement in the Syrian war, ramping up confrontation with Iran, and provoking the Muslim world by steamrolling the Palestinians. What the U.S. should instead do is work with its traditional global partners, as well as China and Russia, to build a framework for peace and stability in the Middle East. It should share the cost of protecting the Persian Gulf pipeline with countries that most benefit from it — namely Japan, China, India and South Korea. It’s contrary to the interests of the USA, certainly, but it doesn’t defy logic: it is being done at the behest of our Zionist masters. The one superpower in the world today, the U.S. has become the bully on the beach. The U.S. has been captured by members of a power elite, that have to wage conflict to justify its existence. From the U.N. through Israel to Asia, the path is akin to shooting oneself in the foot. The idea that the U.S. can sanction with impunity any country it deems necessary to achieve its goals, doesn’t belong in the 21st century. Do as we say, not as we do, is a losing proposition to embrace, for it will bring the downfall sooner than later to the grief of the majority of the U.S. population. The elephant in the room is, as usual, Israel. Israeli security (and that of Gulf monarchies by extension) is the pretext for American mingling consistently repeated by American politicians, and with Kushner running the game, it is baffling that an article like this doesn’t even mention Israel once. What do you mean no strategic interest??? It fits perfectly into Israel’s strategic plans. You’re looking in the wrong place! Thank you for illustrating your thoughts so clearly and providing such a rich collection of information. I’d like to address some of the points mentioned in this post. I have some contrary thoughts on key segments and hope that this will help myself and others to together think over the situation in order to understand some of its complexities. I apologise for the length of this comment and understand if you choose not to include it because of this. I enjoyed reading your piece and it provoked many considerations in me, so I want to give it the respect it deserves in order to respond in kind and to think alongside the post. I don’t think this is the case. Let me be clear that I think geopolitical interest is a subjective category, meaning that what you perceive is in the interest of a given party is based on the kind of world you desire, what international and domestic society you judge best suitable for that goal, and what systems and tools you bring to bear in order to try and create or maintain the particular domestic and international social world you have designs for. Of course, then, whatever you understand as national or geopolitical interest will vary accordingly. As I understand the term and tradition of geopolitics, it is tied to a contest for international power and dominance. Therefore, I’ll not judge the situation you’ve so kindly presented based on my own principles of what I think are best for the people. In this particular case, I’ll judge US ‘interest’ according to a zero-sum contest for global power over others, for hegemony. So, in this case, I take the geopolitical interest of the US to be the one defined by the narrow group of people who are in charge of policy and its execution on the world stage. I’ll elaborate on this point a little further… Geopolitical interest, from the perspective of these ruling elites, is one in which the US has pride of place on the world stage. That the leaders of that country are at the very least afforded a chief seat at every table of international decision-making; that the institutions and systems of norms, rules, and decision-making processes be according to their design. In short that the US, as a country provides these select groups the means by which to exercise power over others on the world stage, to such an extent that they’re ‘world leaders’, or more directly: that they can call the shots and compel others to follow their lead. There’s enough evidence to show that this is indeed the desire of the most powerful among the governing elites, by simply quoting and referring to their reports, strategy documents, goals documents, etc. However, if you still doubt this, then maybe you would consider humouring this as at least a fantastic possibility and then seeing if, in this definition of ‘geopolitical interest’ the currently visible Middle East strategy is indeed logical for the purpose of global hegemony. I think that the reason that these bases, in Bahrain, Qatar (and other relevant regional locations) are valuable is that much of the world’s oil supply passes through the Gulf, and from there to other parts initially by sea. A threat posed by Iran is not that the bases will be attacked but that that particular transit route of oil and gas is threatened. The threat could come in non-military form, by establishing alternate routes: via land (pipelines as most obvious) through Central or South Asia eastward, north to Russia, west via Syria perhaps to Mediterranean ports that can then expand an alternate route via the sea there, etc. Therefore, threat of instability and conflict at the very least decreases the attraction of these alternatives. The current route affords the US with primacy as a policing agent that can OK or deny access to the existing sea-borne route. That route, if not directly vital to the US domestic consumption, is vital to that of others such as India, China, Japan, S. Korea, etc. For example, this is (only) part of what can permit the US to effectively sanction other countries that import Iranian oil against US wishes and embargoes. However, here we can see that the scenario I just gave is only partially true. There’s a non-military, political-economic component that hasn’t been yet mentioned. That is, that an alternate route may well also establish an alternate supporting economic and financial system to make it possible. New insurances, new foreign exchange regimes for trade payments, etc. than those already established in favour of the existing system. The existing economic, political (international rules systems), and financial mechanisms used in the current energy flow are established in the US and that of its allies, favouring that alliance system along with its geopolitical interests. An alternate system could favour the interests of an altogether different group. For example, China’s Belt and Road Initiative is just such a case. It builds new transit routes for all manner of goods, favours new terrains secured by their own military strong-points, and establishes a new set of international rules, organisations, and financial systems. For the sake of keeping this comment/response from getting far too long, I’ll not go into an explanation of the incredible power afforded to the US via the US dollar’s role as the global reserve currency. The function of the dollar in that role is currently heavily tied to its role as a medium for the global exchange of oil. Changing circumstances such as transits routes, financial institutions, etc. are important in undermining or maintaining this. So, I think that no matter the reduction of direct utility of Middle Eastern oil for the US domestic market, or of trade with that region, the Middle East is very important, perhaps vitally so, for the maintenance of US global power projection in its existing form. Thanks for taking the time to write, and, therefore, for pushing me to think. Question. Have Iraq and Iran been used like a strategic oil reserve? Conflicts have delayed development of oil reserves. The 2003 Iraq invasion to remove Saddam was to be followed by development of Iraq reserves but the shale oil bonanza intervened.